RTG's Triple Twister slot game has literally taken the internet by storm and no one loves it more than an Intertops Casino player that recently celebrated a big win on the popular game. By the time the game’s Wild Tornado symbol finally touched down, the nurse practioner had won $11,000 on a $25 bet. The winner said her lucky win will help with some bills, but she said she’d also use some to take a nice vacation. 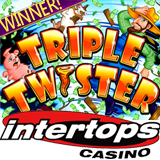 The popular Triple Twister slot has a bonus round (nine free spins) triggered by three or more Weather Vane symbols. Its Win-Win feature makes sure no one finishes the bonus round empty-handed. Intertops Casino offers hundreds of real-money online casino games including Blackjack, Roulette and some of the world’s most popular online slots. Some, like Aztec’s Millions, have million dollar jackpots. Its $210,000 Cycle Tour Scoreboard will continue awarding weekly casino bonuses up to $500 until September 1.